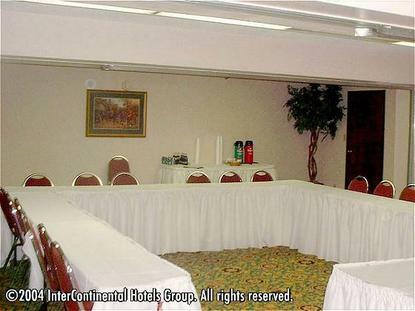 The Holiday Inn Norman Oklahoma is the only full-service hotel in the area. Located on Interstate 35, we are minutes from the University of Oklahoma, home of the Oklahoma Sooners The Holiday Inn Norman is near NEXRAD Corporation as well as Johnson Controls Corporation. Only minutes from downtown Oklahoma City and Will Rogers International Airport. We are near the new Riverwind Casino and Goldsby Casino (3 miles away). All of our 149 newly decorated rooms feature desks with data ports, Irons w/ ironing boards, hair dryers, coffee makers, 25" color televisions with 50+ channels, HBO, movies on demand and Nintendo, video check-out from your TV. A complimentary USA Today delivered daily to all rooms Mon-Fri. During your stay, you may want to take advantage of some of the benefits of a full service hotel. Our amenities include fast and efficient room service, a full service restaurant, lounge, convenient self service business center, Free high speed Internet, as well as an exercise facility, indoor pool and hot tub. In addition we have 7,000 square feet of newly renovated, meeting space to accommodate any size meeting. From small meetings in our Executive Boardroom to large meeting and banquet events in our Emerald Ballroom. We are the meeting place in Norman, Oklahoma. For your next weekend getaway, business trip or meeting the Holiday Inn-Norman is your home away from home. We hope to see you soon This hotel is committed to providing accessible facilities under the American Disabilities Act. If your accessibility needs are not met, please contact the Hotel Manager on Duty. Should you require additional information regarding accessible facilities for guests with disabilities, please call 1-800-Holiday (U.S. and Canada) or contact the hotel directly. For the hearing impaired, TDD service is available at 1-800-238-5544 within the U.S. and Canada.